Sunday saw some huge performances on both sides of the ball, but several of the usual suspects were once again among the best defenders in the league. With that in mind, let’s take a look at the Sunday Standouts on defense in Week 15. Cameron Jordan has enjoyed a huge season on the edge of the New Orleans Saints defense. With a hit and three hurries from 36 pass-rushing snaps, his pass-rushing productivity rating of 8.3 ranks just 31st among edge defenders so far this week, but he made an impact with four batted passes. We really should rename this list Sunday Standouts featuring Aaron Donald at this point, with the Los Angeles Rams star a fixture each week. Once again he was completely unblockable on the defensive interior, racking up three sacks, two hits and five hurries, good for a 26.6 pass-rushing productivity rating. Dallas Cowboys cornerback Anthony Brown allowed an NFL passer rating of 71.1 on throws into his coverage on Sunday Night Football, with three receptions allowed for 56 yards on 30 snaps in coverage. Where he really stood out though, was in forcing three incompletions by way of pass breakups. It hasn’t been a great season for the Cincinnati Bengals, but Geno Atkins has once again been a standout on the defensive interior. That was the case again yesterday in the loss to the Minnesota Vikings, with Atkins producing a 23.3 pass-rushing productivity rating of 23.3, with two sacks and two hurries from 15 pass-rushing snaps. 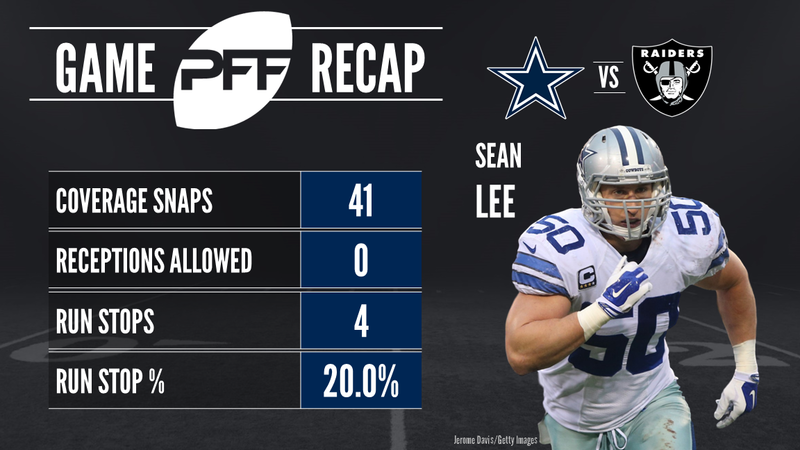 Linebacker Sean Lee has had a big season for the Cowboys, and it continued on Sunday Night Football with another strong performance against the run in the win over the Oakland Raiders. From 20 snaps in run defense, Lee racked up four tackles resulting in a defensive stop, good for a 20.0 run stop percentage. This game was a microcosm for the season for New York Jets cornerback Buster Skrine, in that he allowed six receptions, but was still solid in coverage. Allowing an NFL passer rating of 75.2 on throws into his coverage, Skrine allowed an average of just 6.3 yards per catch, and forced an incompletion with a pass breakup. The Minnesota Vikings clinched the NFC North with a win over the Bengals on Sunday, and linebacker Eric Kendricks was a star on defense in the game. With five plays where he was the primary coverage defender, Kendricks allowed just two receptions for nine yards, and had an interception return for a touchdown. It wasn’t a big day in terms of stat line for Philadelphia Eagles interior defender Fletcher Cox, but that doesn’t mean he didn’t make a huge impact. With a PFF run defense grade of 88.6, and a pass-rush grade of 80.0, Cox forced running backs to cut away from their intended path, and generally made life difficult for the New York Giants offensive line. It feels like Tennessee Titans interior defender Jurrell Casey never gets enough credit, and he delivered another big time performance in the loss to the San Francisco 49ers yesterday. From 22 snaps against the run, Casey made five tackles resulting in a defensive stop, giving him a 22.7 run stop percentage on the day. 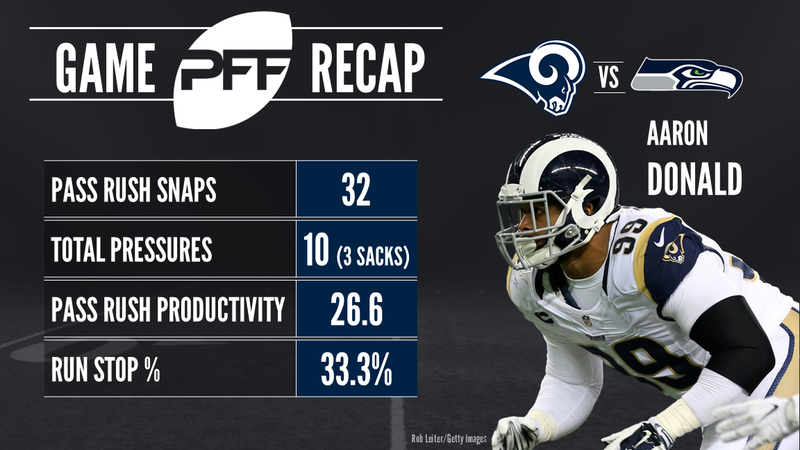 PFF’s Sam Monson has been waiting for the Troy Hill breakout game ever since our first season of college football grading, and he was finally rewarded, with the Rams cornerback impressing yesterday. Allowing just one reception for four yards on four passes thrown into his coverage, Hill finished the game having allowed an NFL passer rating of just 39.6.